The cover of this book gives us a hint of the craziness that will ensue. Thirteen-year-old BJ's life turns upside down when a big, burly, biker named Merv comes knocking on his door and gets in an argument with his father. BJ is royally confused about the fight and can't make sense of the hushed whispers and sudden outbursts between this giant stranger and his father. When Merv rides off, he drops an old notebook that turns BJ's life upside down. In it, he finds the perfect formula to become a "master in the art of rocking." He decides to ditch the boring life and become a "full-on, fire-breathing MEGALORD OF RRRRROCK!" Not so easy when you can't play an instrument and you basically have the musical talent of a seahorse. BJ changes his name to Nigel "Hot Wings" Thunderdome, and follows the how-to-become-a-rockstar guidelines in Merv's notebook. He looks for other band members and soon, he finds himself in hot water and on the run. Out of state. Without his parents permission. Seems everyone wants a piece of "Hot Wings" and maybe, just maybe this whole let's-pretend-to-be-a-rockstar bit isn't just for fun. What if he truly is meant to be a megalord of rock? 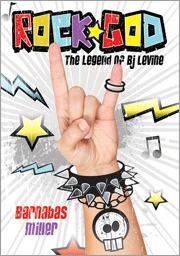 Hilarious, wild ride full of Bon Jovi references and crazy shenanigans! A middle grade boy will love the adventure and silly song titles like "911 Emergency Toast."